It seems that shooters worldwide have an appreciation for polymer-frame pistols, and regardless of how many models are on the market, there is always a new kid on the block trying to make a name for himself. Enter the Diamondback Firearms Co. of Cocoa, Fla., which offers a line of compact and subcompact .380 and 9mm pistols that have proven popular with licensed civilians and police officers who need a small, lightweight, concealable pistol for backup or off-duty carry. And while tiny pistols seem to be all the rage nowadays, there is a still flourishing market for service-style pistols, and to capture a share of this market, these Floridian entrepreneurs introduced the Diamondback DB FS Nine. The Diamondback Db FS Nine is based upon a glass-reinforced polymer frame and tips the scales at a comfortable 21.5 ounces. It has an overall length of 7.8 inches and a width of only one inch. 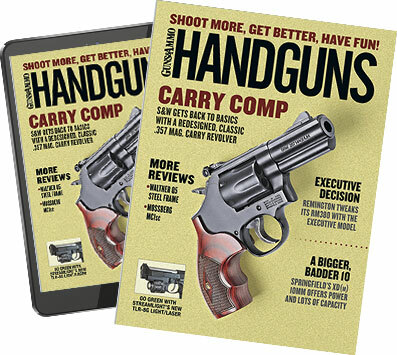 While intended as a holster-size pistol, its dimensions and mass would make it equally suitable for concealed carry with the right holster and attire. The FS Nine has all the features shooters have come to expect from a striker-fired pistol. The slide stop and mag release are well-located and function like they should, and the gun features a squared-off trigger guard. The frame has a moderate beavertail tang that aids in the recoil control department while a Picatinny rail on the dust cover permits the shooter to mount a tactical light or laser. Another nice feature is the flared magazine well opening, which is a great aid for fast, fumble-free reloading, especially under pressure. I don’t understand why manufacturers keep putting recurved trigger guards on their pistols—I don’t see anyone putting a support-hand finger there—but the Diamondback DB FS Nine has one for those who do shoot that way. The Diamondback DB FS Nine uses a double-action-only trigger with a hammer block safety on its face that must be depressed before the trigger can be pulled. Such triggers not only simplify the operating drill, but also provide additional safety while allowing the same, consistent trigger pull for each shot. Like many of its striker-fired contemporaries, the Diamondback DB FS Nine does not have second-strike capability; the slide must be retracted slightly to reset the striker in the event of a misfire. The pistol features three-dot sights—the rear drift adjustable for windage—and the back of the frame has a moderate beavertail tang, which helps control the gun during recoil. The slide is machined from 4140 steel and has a matte blue finish that protects it from wear and environmental extremes. A generously sized ejection port and large extractor ensure that fired cases get out of the way reliably. A semicircular cutout in the barrel hood allows the shooter to verify if there is a round in the chamber. Additional safety is provided by a cocked-striker indicator at the rear of the slide that provides visual and tactile indications of the pistol’s condition. The slide reciprocates on two chrome-moly steel rails on the cam block and is further stabilized by another pair that is integral to the rear of the frame. The trigger is constructed from chrome-moly steel and has a black-oxide finish while the other parts of the trigger mechanism are Melonite-treated for hardness and increased durability. Accuracy at 25 yards was decent, but the pistol had trouble feeding one particular load. The author thought it performed well in drills, too. Fore and aft slide grasping grooves allow positive retraction of the slide from different positions even with wet or oily hands or when wearing gloves. As has become de rigueur on service type pistols today, the front sight has a white dot while dual white dots grace the rear. The latter is dovetailed into the slide and can be adjusted for windage. I am not a fan of three-dot sights, but I will admit that those on the Diamondback DB FS Nine were large and fast to acquire. The Diamondback DB FS Nine I received had a hand-filling grip and a well-balanced heft to it. While the grip-to-frame angle appears rather sharp, the pistol actually pointed very naturally both with two- and one-handed grips. The slide stop and magazine release were well located and worked positively. Accuracy testing was conducted from a rest at 25 yards. The trigger displayed the usual new-gun stiffness and had to be nursed along, but once I had the hang of it, I was able to produce groups in the three- to four-inch range. It did not care for the long 147-grain Winchester ammo, a number of which hung up on the feed ramp. The gun shipped with only one magazine, so I wasn’t able to run a lot of drills with it. I did poke a lot of holes in a Dirty Bird combat target from various distances, firing both one-handed and two-handed. I experienced several more failures to feed with the Winchester ammo, but aside from that the Diamondback DB FS Nine ran well and showed itself capable of putting rounds in the higher scoring zones of the target. I have two complaints. One is that the FS Nine comes with just a single magazine. And two, as I often gripe, I wish the gun offered a fiber-optic sight option. But other than that, I found the Diamondback DB FS Nine to be a user-friendly pistol that would be suitable for personal/home/business defense—all at an attractive price.